The Book of Leviticus was especially difficult for medieval Christian theologians. The first book taken up by Jewish boys in their Bible study, Leviticus presented laws that were God's covenant with the Jews. For Christian writers, it was part of the bible, but they could only relate bits of it here and there to Christianity. This created a big problem for them because they could not refute the covenant, which medieval Jews were not about to relinquish, even in the 11th and 12th centuries when they were subject to attacks that were often violent. 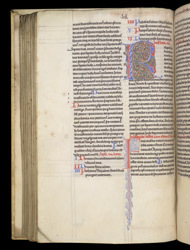 In response, Ralph, a Benedictine monk at St Germer in Flaix, near Paris, wrote, about 1140, a new kind of commentary on Leviticus that took the entire book word for word, reading it as a series of divine commands, expressed in signs of the laws, for each person to act with moral intentions. Ralph's word-by-word explanation launched a new trend for literal Christian commentary which emphasised an individual's interior morality while at the same time causing ever more negative and unreasoning images of Jews. When this manuscript was copied in the 13th century for the monastery at Carthusian monastery of Hinton, Ralph's commentary was well-known and read not only by monks but also by clergy, university students and literate laity. This initial 'R' is combines a 'puzzle' initial (in which the differently coloured parts interlock, like a jigsaw puzzle), filled in with a type of foliage with bud-like terminals, but not real leaves or flowers.